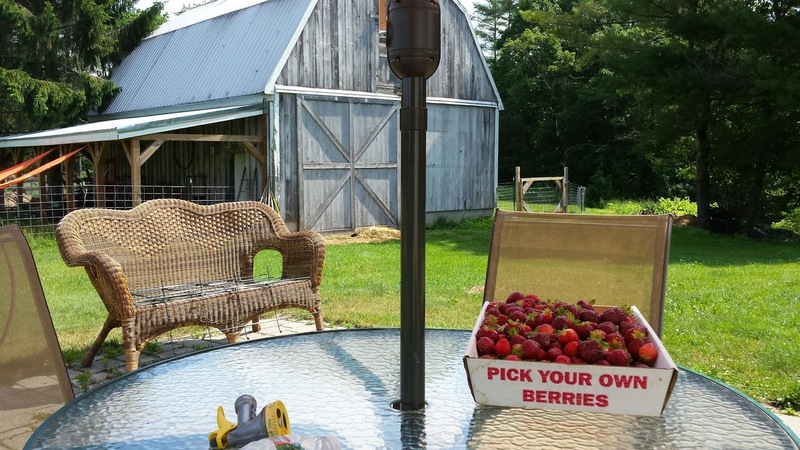 A summer tradition the past couple years is the June trek to LaVigne's Farm to pick the most delicious strawberries. It was a hot morning after rain off and on for the past few weeks, and the berries were just perfect. The real challenge is to be realistic about the time it takes to process them into the freezer, or to make jelly. As luck would have it, there are still frozen berries from last year that will go into smoothies before these are eaten. With the exception of a pint, these were all cleaned and put on trays in the freezer. Perhaps we'll make jelly later in the summer. 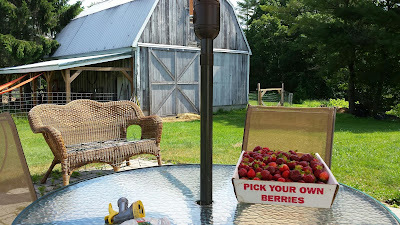 Picking strawberries always takes me back to my grandfather's backyard truck garden on Bayshore Rd. in Cape May. As a child, Gram would let us pick berries and sit out at the side of the road to sell what we picked. We then saved the quarters we earned for skee-ball on the boardwalk, or amusement rides in Wildwood. It seems like yesterday, in the field, feeling the sun on my shoulders, picking the just the ripest berries--I'm a kid again dreaming about the beach and strawberry shortbread with homemade whip cream. I can't wait for the blueberries to ripen up!